Sweet Land 4 is a prize redemption candy arcade machine from Namco which comes with base. This is a great addition to family entertainment centres or recreational areas with lots of kids. Up to four people can play at a time, and turns are quick allowing for quick turn over and the simple game play concept means lots fo replay value. Players simply insert their coins, then press button 1 to begin excavating the candy. Then they press button 2 to dump the candy on the sliding boards which, once they have built up, will be pushed off the edge and into the chute for players to collect. This four player cabinet still has a relatively small foot print, allowing it to fit into a number of different locations, while the attractive and brightly, LED-lit cabinet will attracts players in from all across the floor. 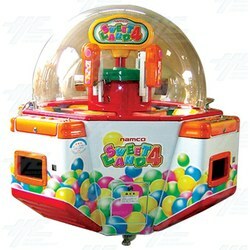 Sweet Land 4 is a prize redemption candy arcade machine from Namco which comes with base. This is a great addition to family entertainment centres or recreational areas with lots of kids. Up to four people can play at a time, and turns are quick allowing for quick turn over and the simple game play concept means lots fo replay value. Players simply insert their coins, then press button 1 to begin excavating the candy. Then they press button 2 to dump the candy on the sliding boards which, once they have built up, will be pushed off the edge and into the chute for players to collect. This four player cabinet still has a relatively small foot print, allowing it to fit into a number of different locations, while the attractive and brightly, LED-lit cabinet will attracts players in from all across the floor.